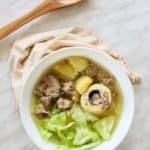 Mung bean stew or monggo guisado is one of my husband’s favourite dishes – the one that takes him back to his childhood in Manila. So, I had to get this right. Hahaha. I wanted to re-create it using the Instant Pot. 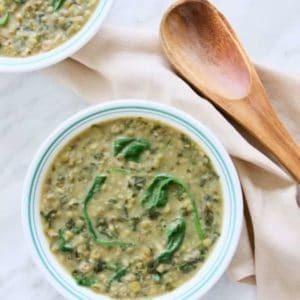 At first, I was cooking just the mung beans in the Instant Pot and adding the cooked mung beans to the rest of the ingredients in a different pot. Then, I thought, why not just cook the entire dish in the Instant Pot? One less pot to wash, right? So here it is, one-pot mung bean stew or monggo guisado. This dish is typically made with some pork. I have used pork belly or pork shoulder roast, cut into 1/2 inch pieces. Ground pork also works too. Try to get pastured pork if you can. See my food philosophy here. You can also use shrimp instead, if you prefer. Or make it a vegan dish and omit the pork or shrimp entirely. Rinse the mung beans before using. Add some greens too. Try spinach, swiss chard or even moringa or malunggay leaves. Moringa is such a superfood, usually consumed in powder form, but did you know that the actual leaves can be eaten and added to dishes as well? I get a frozen pack of malunggay from the Asian store, the package also says horseradish leaves. 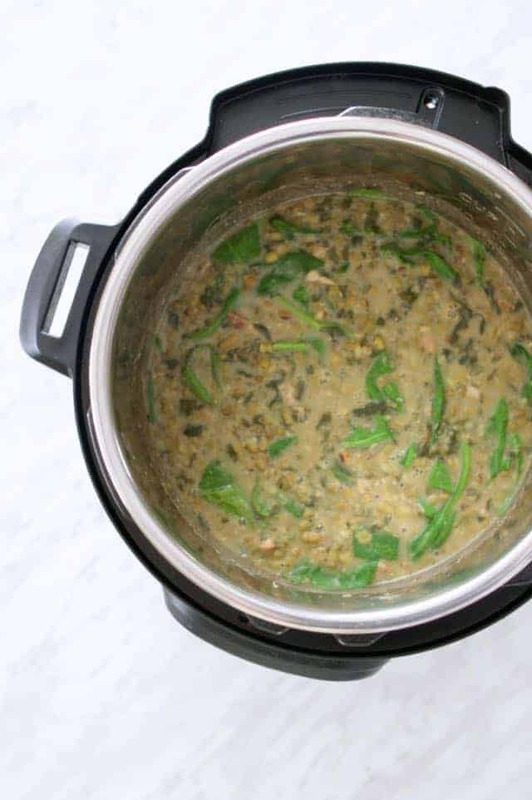 If you can’t find malunggay or moringa leaves, use spinach instead. But add spinach at the end, after cooking the stew. I’m a huge fan of the Instant Pot. This is the one I have. It just makes cooking so much easier, allowing me to use cheaper, tougher cuts of meat which come out tender after pressure cooking. In Sauté mode, add coconut oil. Add the garlic and onions and sauté until the onions are translucent and fragrant. Add the pork and sauté until browned. If it gets too hot, turn Sauté mode on/off intermittently. Next add the mung beans, water, malunggay or moringa leaves. I just cut the malunggay or moringa leaves pack open and dump all the contents in the pot. If you’re using spinach, add at the end. 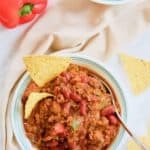 Set the Instant Pot to Bean/Chili (or manual mode) for 10 minutes. When it’s done, let the pressure release naturally. Open up the pot and add salt. 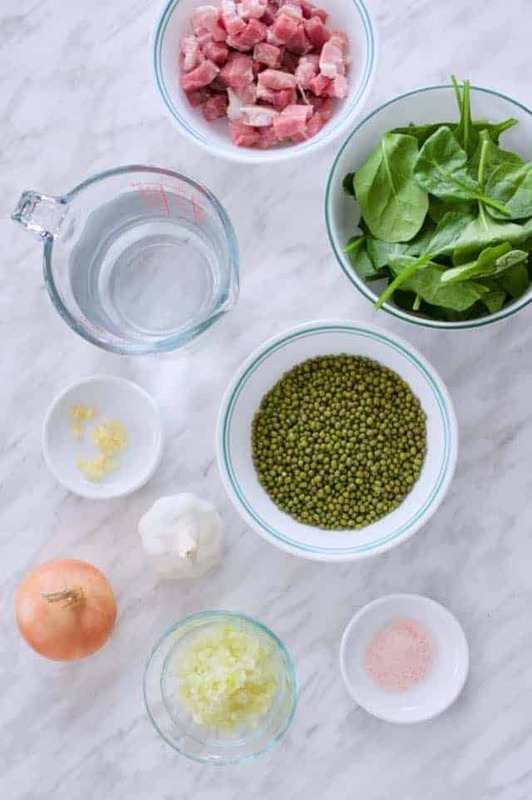 Add the spinach now, if using. Total cook time would be about 1 hour = sauté time + time to build pressure + cook time at pressure + time to release pressure. Tried this recipe? Please leave a rating or comment below! Set the Instant Pot to Sauté mode and melt the coconut oil. Add garlic and onions, sauté until onions are translucent and fragrant. Add pork, sauté until lightly brown. Cover and set to Bean/Chili (or manual) for 10 minutes. When done, let pressure release naturally. Add salt (and spinach if using, then allow spinach to wilt). You may substitute shrimp instead of pork, or omit entirely. If using shrimp, add at the end, after releasing pressure. 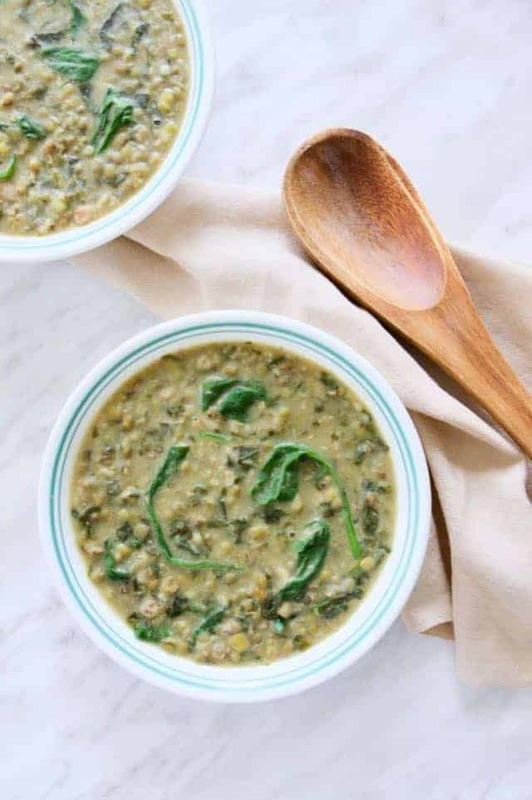 You may use swiss chard or spinach, instead of moringa or malunggay leaves. Or use a combination of greens. Total cook time = sauté time + time to build pressure + cook time at pressure + time to release pressure. Melissa I made this tonight and it was awesome!! So tasty and comforting. It will become a firm family favorite I am sure. Aww, Alison, this made my day. Thanks for letting me know! So glad you liked it! Hi Roli, I’ve never had this happen before. Was the Instant Pot vent sealed? Just had this for dinner tonight. Its good. I added a bit of chicken cubes though. I was at Costco looking for rice. The Costco dude pointed out that there was a huge close out sale on mung beans. My mother-in-law (Filipino) use to make mung bean stew. Never taught me how but I can sometimes recreate stuff. I get it at a few places in San Diego. So I decided your recipe looked very similar to what I remembered. Here are my notes. I did saute onions and pork (added garlic and bell pepper). 1 can coconut milk, 2 cups mung beans 5 cups water. Forgot i had opened a beef stock, next time. cloves, salt and away it went. Selected stew for 35 minutes since I did not soak the beans. When I went to taste, it was a bit bland. My wife asked if I used ginger and fish sauce. And said should not have added the cloves. But adding these at the end is no problem. I added and not exactly my mother-in-laws dish but close and I like it. I think this is a day after type of stew where tomorrow it will be even better. I added the spinach just after I released the steam and it cooked perfectly. Thanks for the recipe. Thanks for sharing your notes. I’ve never tried it with cloves before either. Good to hear you were able to make something close to your mother-in-law’s dish. follow up note, although the flavor was more rich the next day, the beans dried up the liquid which is where a great deal of the flavor lives. I added my beef stock to give it a bit of soup and it was delicious. Hi Melissa. 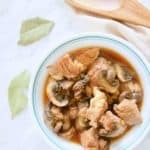 I’m new to Instant Pot. In your notes you say to cook for an hour but in the body of your recipe, you say to cook for 10 minutes. Can you answer which cook time is right? The total cook time of 1 hour includes the sauté time, pressurizing and de-pressurizing. The actual Instant Pot cook time is 10 minutes in Bean/Chili or manual mode at high pressure. Hope that helps! Let me know if you have any other questions. Hope you enjoy your Instant Pot! I loved this stew! 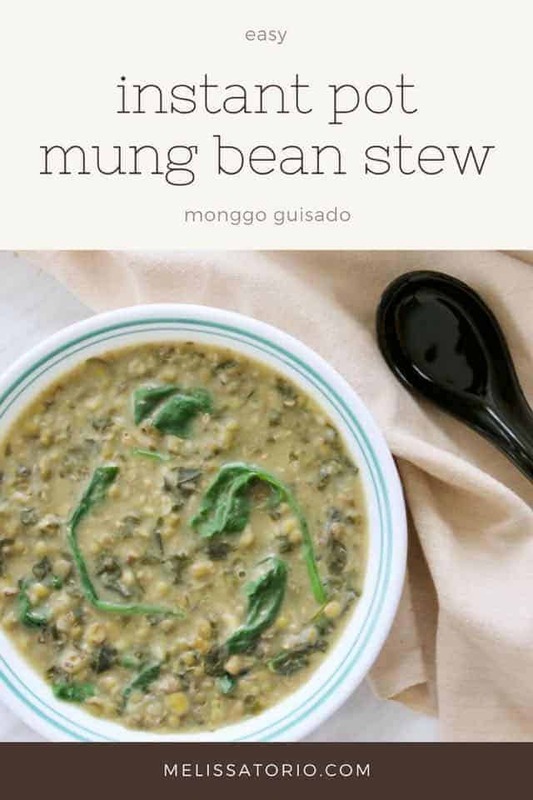 I had a bag of mung beans to use up and gave this recipe a try. It didn’t have a lot of ingredients or seasoning, so I was worried it would lack flavour. Not at all! It was rich and flavourful and everyone loved it – from my two year old son to my 80 year old mother. It also took almost no prep or cook time. I will make this over and over again.